When you walk the desert quietly and alone long enough you quit observing it in a conscious manner, and you learn things in the silence of the desert. There are all kinds of things you can contemplate and learn if you accept silence of the desert and walk alone. You will find joy in such things as contemplating the ways of the various plants like the yucca. Like all plants it is fascinating, and to understand it, is to understand many things about it’s environment. We can start here, by taken an imaginary hike across the desert. In the distance we see a small patch of Yuccas perhaps fifty or one hundred plants on ten or twenty acres. Just from being aware of their presence we know certain things. There is almost certainly an increase in the variety of desert plants among the yuccas, and of course there is the constant companion of the yucca, the pack rat. The yucca that has a pack rat's nest at its base usually grows bigger and has a better chance of survival than those that do not. Here is a sample of how the basic systems and relationships of the Yucca work. The Yucca's root system draws in all the moisture and nutrients it can from the ground around it. Then on the next level up the pack rats run around on the surface doing their part, such as collecting all sorts of things like small bones, leaves, branches, and other things within a radius of about 20 yards. This is far beyond the reach of the yuccas root system. The pack rats do this to build their home in the shelter of the Yucca. They will also deposit bits of leftover food and their own urine and droppings. When it rains, the nutrients from all these decaying items are washed down into the soil so that the Yuccas root system can absorb them, making this particular yucca bigger and healthier than the others near it. This in turn attracts all sorts of birds that prioritize this particular Yucca to perch on. Then their droppings and various leftover parts of their prey fall to the ground, and helps this yucca grow even more. 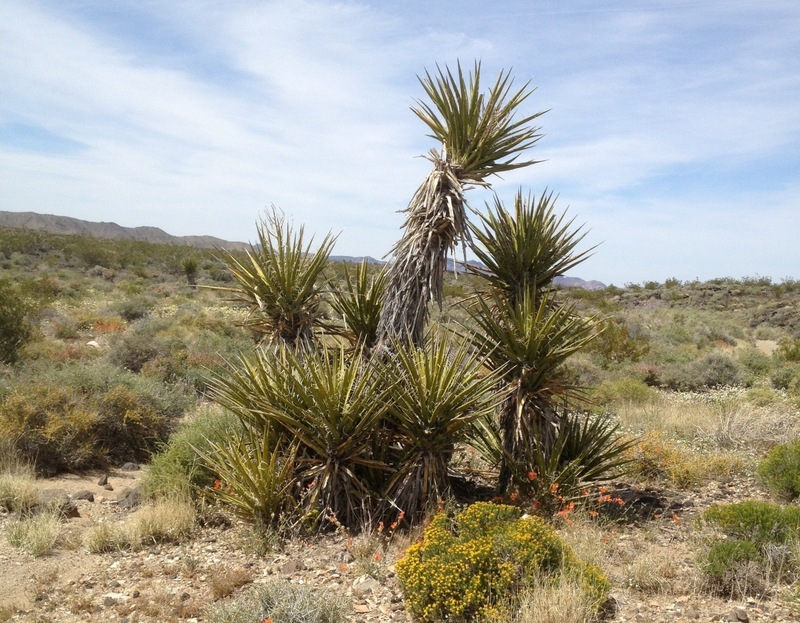 So a yucca like this can be visualized as a point in the desert environment that is growing upward by attracting and utilizing resources on three levels. 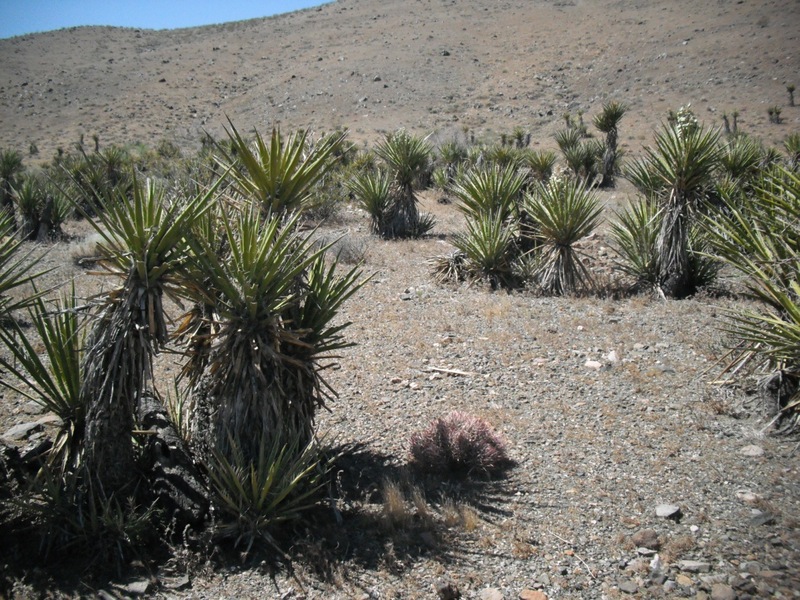 Also this yucca's presence is radiating outwards into the desert environment through its root system, the pack rats system, and the bird's system. Not all yuccas have this middle way, of the pack rat, to radiate out into the desert environment. While the pack rat system makes a significant difference in the lifecycle of the yucca, the pack rat also makes a significant difference in the desert environment as well. One of the many reasons for this is that the pack rat is a mammal and not a reptile. As a mammal it is active throughout the year and in a wider variety of weather conditions that any reptile. Thus the yucca, through the pack rat provides food for such animals as a kit fox and the owl, when there would be little or perhaps no other food source available to them. And while the yucca provides some food for the pack rat directly, it’s indirect effects in the desert environment are more important. This is because these effects are amplified by other plants. To get a basic understanding of this we must start with the shape of the Yucca itself which has two basic shapes. There is the Yucca plant that has many stalks, perhaps five or ten, and then there’s the yucca plant that has a single stalk. The more stalks the yucca plant has the more likely it will have some that are very tall, and will have a rat nest in the middle of it. These large yuccas cast a very dense and important shadow on the desert soil beneath them. This conserves the soil's moisture so much that you can often trace the intensity of this shadow by the increased size and health of the annual and perennial plants that grow there. The yucca’s that have a single stalk, of course, has a smaller shadow, but it still a very important one. You can often find a large perennial plant such as the cholla or barrel cactus growing in its shadow. Oftentimes this happens right where the head or green part of the Yucca casts it shadow. If we have a cholla cactus growing in this shadow it too has a shadow that in turn preserves the moisture in the ground allowing yet another plant to grow there. Thus the life-giving shadows of the Yucca echo across the desert landscape for centuries. Sometimes these reverberations will split off from one another and start a separate chain of events. Here is an example of the barrel cactus growing in the shadow of the yucca. While this can happen in many ways, here is but one example. Let’s say a cholla cactus grows up in the shadow of the yucca. Then the shadow of this cholla cactus allows a creosote bush to get started. Then the cholla, being a plant that lives a relatively short time compared to the yucca and creosote bush, dies and decays. So when you see this yucca and creosote bush they do not seem to be associated with one another, but they once were. You can see this if you read any clues that might be there, and use your imagination see far enough back in time. Then going forward in time the shadow of this creosote Bush will eventually make things right for another perennial plant to start, perhaps even another yucca. So next time you walk the desert and you see in the distance a group of yuccas, you can use this knowledge and the power of your imagination to see in to the deserts environment deeper in time and distance. We should remember, however, that the reality of the yucca and the desert environment are infinite in their complexity. And knowing and experiencing these kind of things allows us to become part of this infinite and complex environment, and this, is THE WAY OF THINGS.